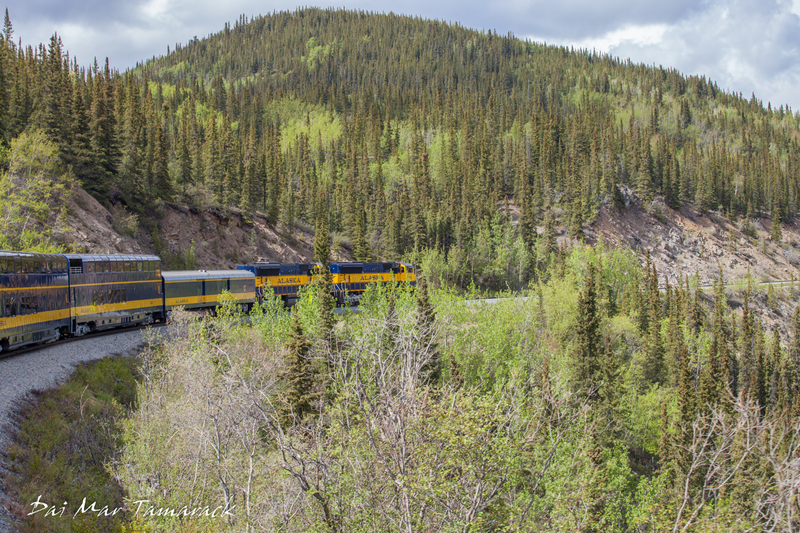 After taking the scenic train up to Denali from Anchorage, Heidi and I were ready to get deeper into the wilds of the park and check out some of the animals and hiking opportunities. It is an unusual set-up in Denali. There is just one road that winds through the park and you are not allowed to drive yourself. You have to get on either a tan tour bus, or a green jump-on jump-off safari bus. If you get a green bus you can have it drop you off wherever you want and set off on a hike. 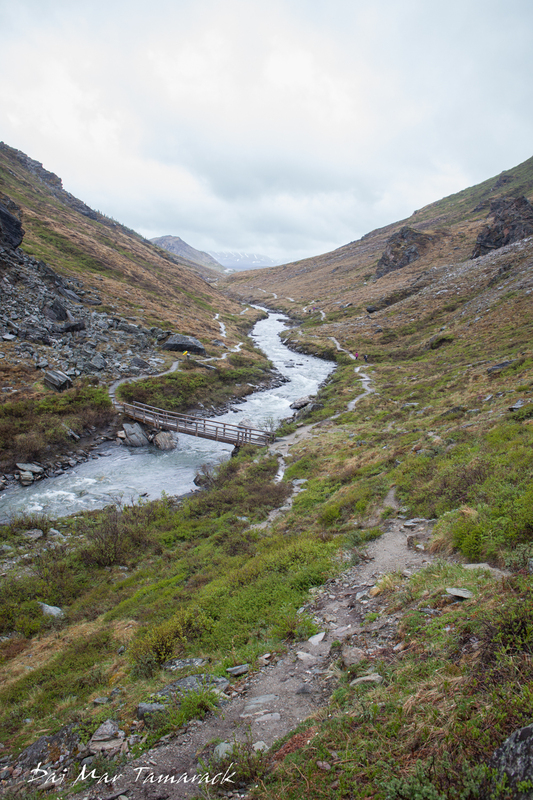 The freedom to go anywhere definitely embodies the Alaskan spirit, but makes you think twice when you are hiking through bear country. On day 1 we took the green bus as far as we could. 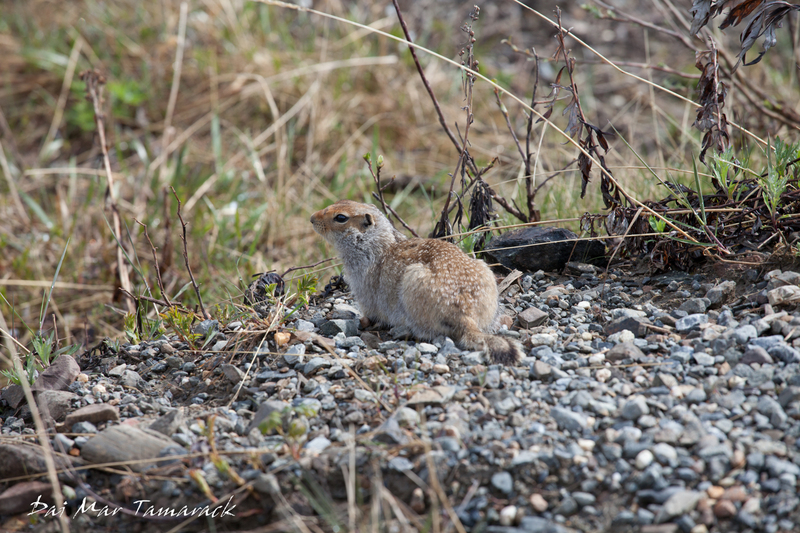 Wendy, our driver, was great about giving narration along the way as well as stopping and pointing out wildlife. 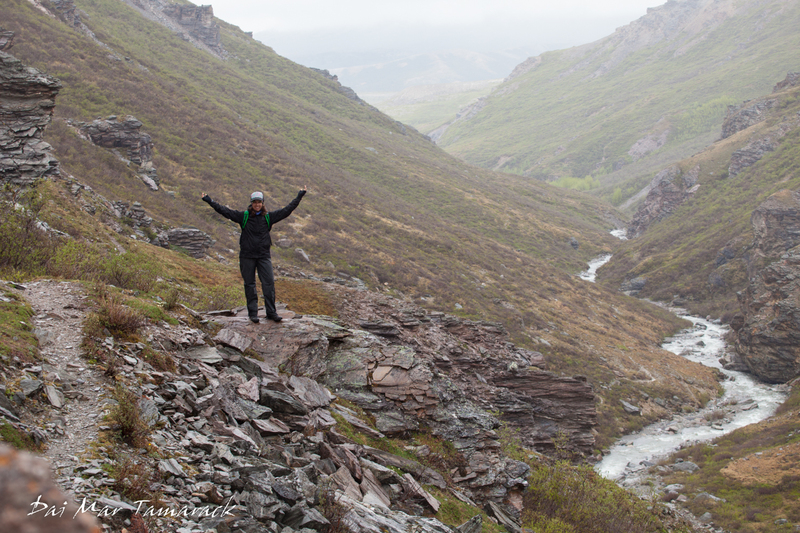 We were looking for the Big 5; Moose, Caribou, Bear, Wolf, and Dall Sheep. We got pretty lucky and saw four out of the five. The wolf was the elusive one but we knew that going in. Our first sighting of the big 5 came before we had even entered the park proper. Just outside of the visitor center we spotted a moose only a few feet off the road, chomping away at some six foot tall willow. She continued to eat there while we took pictures from the safety of the bus. We had been warned that it was moose calving season and that a protective mother moose could be just as dangerous to run into as a bear. 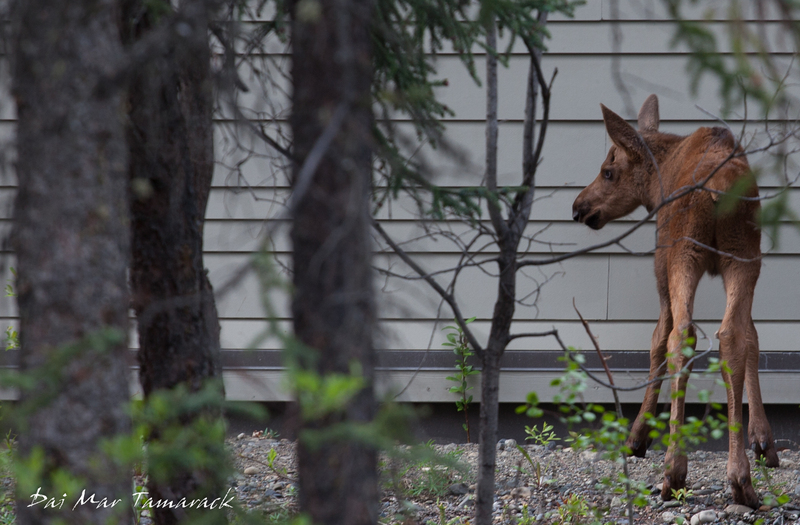 We did see a mom and baby at the very end of our day, again back near the visitor center. The weather was misty, cold, and sprinkling rain. 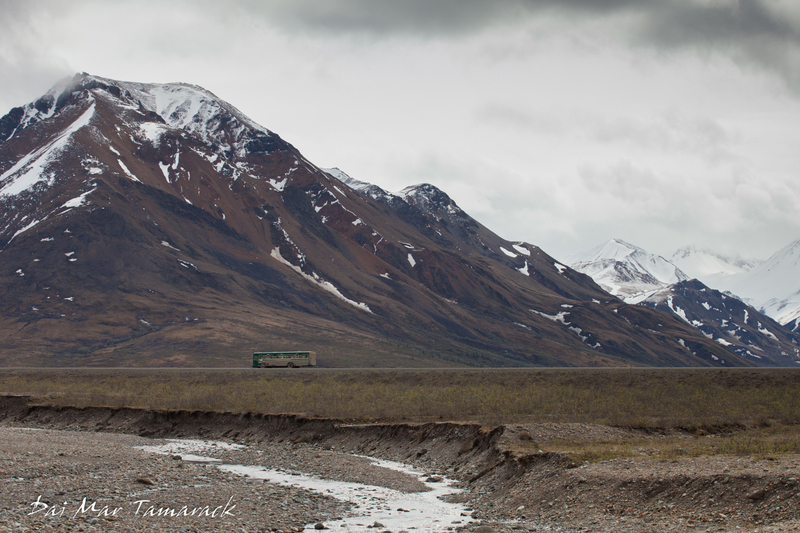 This turned into freezing rain and snow as we drove farther up into the high elevation tundra. 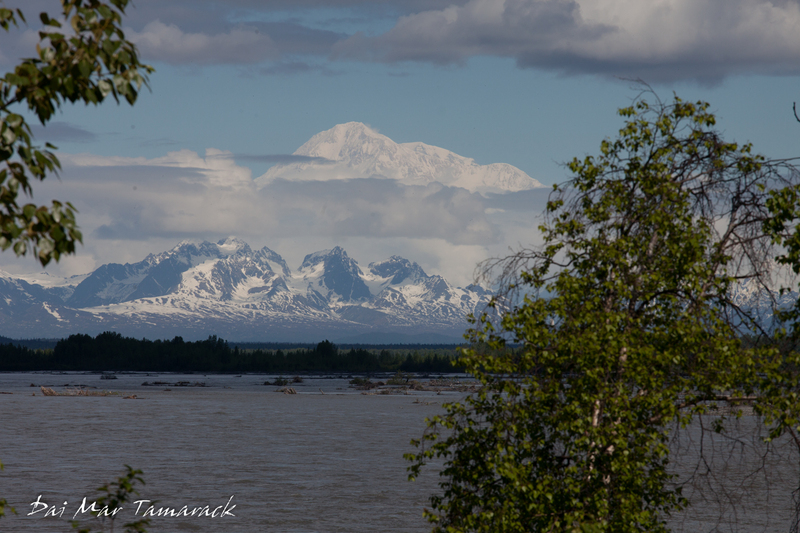 The views were still beautiful even though we couldn't see all the way to Denali Mountain, some 70 miles away. 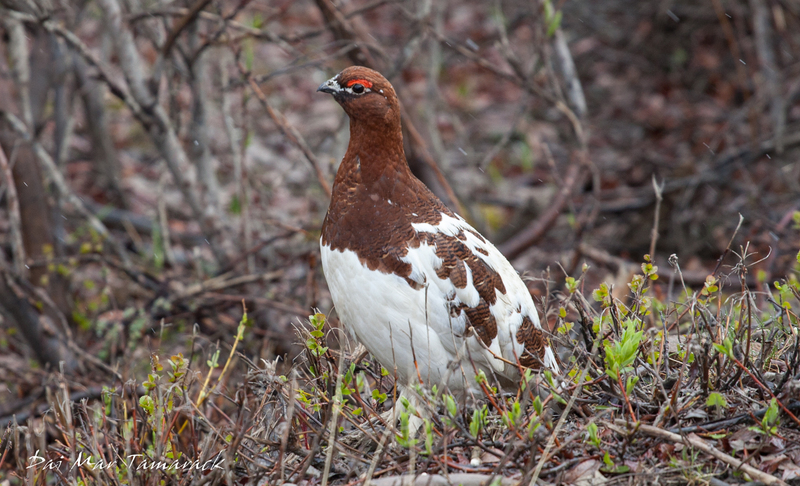 We stopped for more moose sightings, a grizzly bear, lots of sheep, some far off herds of caribou, and a couple of beautiful ptarmigans, the Alaska state bird. We took the bus as far as it would go this early in the season, which was about 50 miles in to a place called Tolkat. 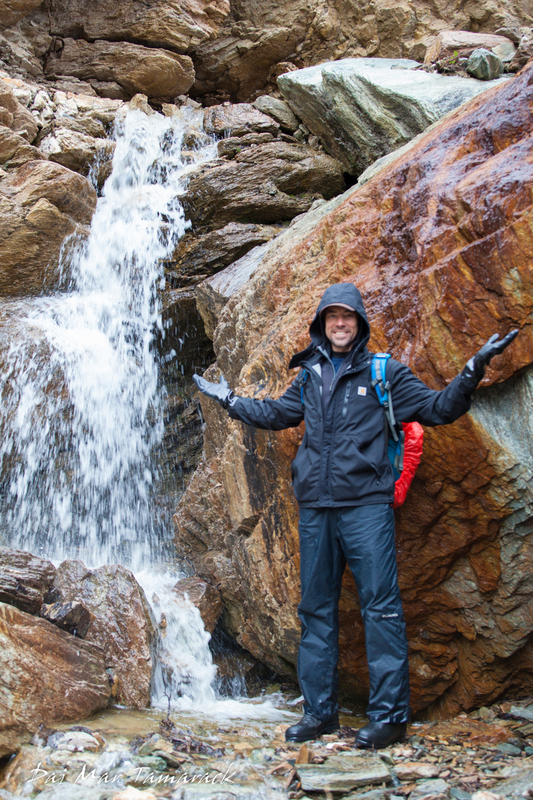 Here we jumped ship, tossed on our hiking boots, and set out to explore the exotic winter-esque landscape. 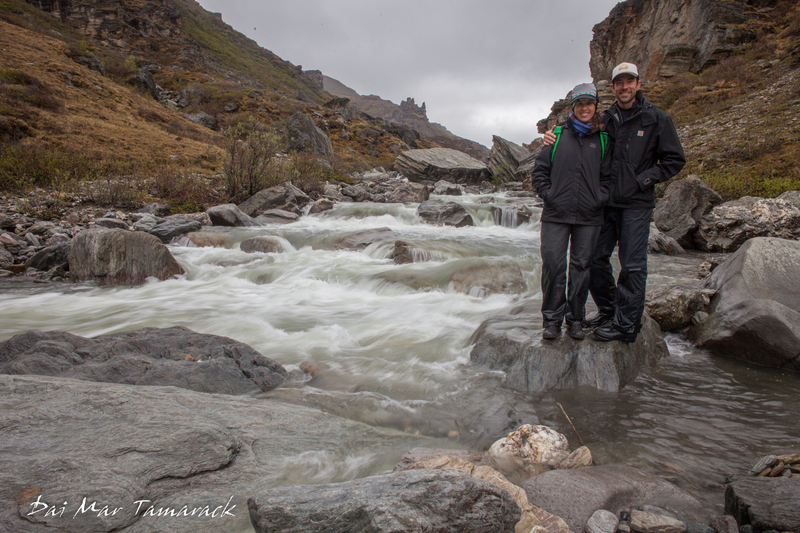 We bushwhacked, crossed streams, followed river beds, all while surrounded by a panorama view of snow capped mountains. On the way back to catch a return bus we even spotted another grizzly moving across the same river bed we were walking on...a safe distance away. Day 2 we wanted to devote more to hiking. 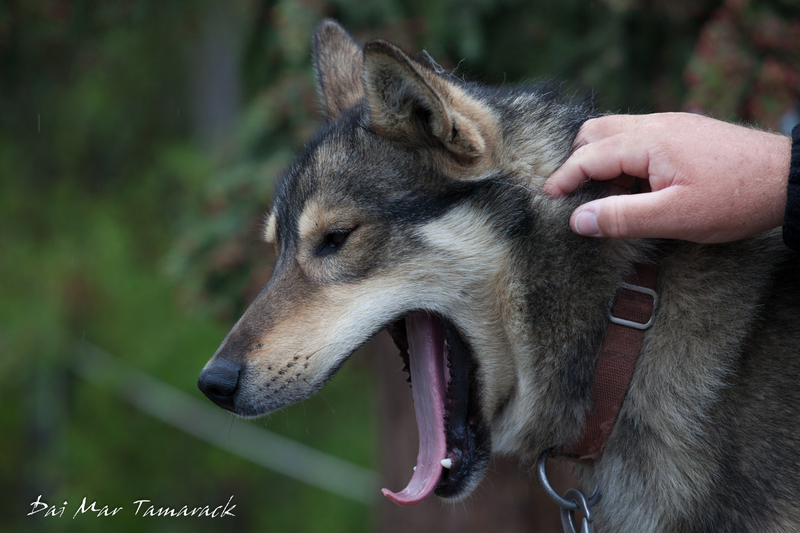 We spent the first part of the morning checking out the national park sled dogs which was a blast. You can read about that here. Then we jumped on a free shuttle that goes 15 miles into the park to a place called Savage River. From here we set off on a well manicured river loop trail, but instead of looping back we continued on a small trail that went farther and farther into the valley. It was a beautiful and secluded place. 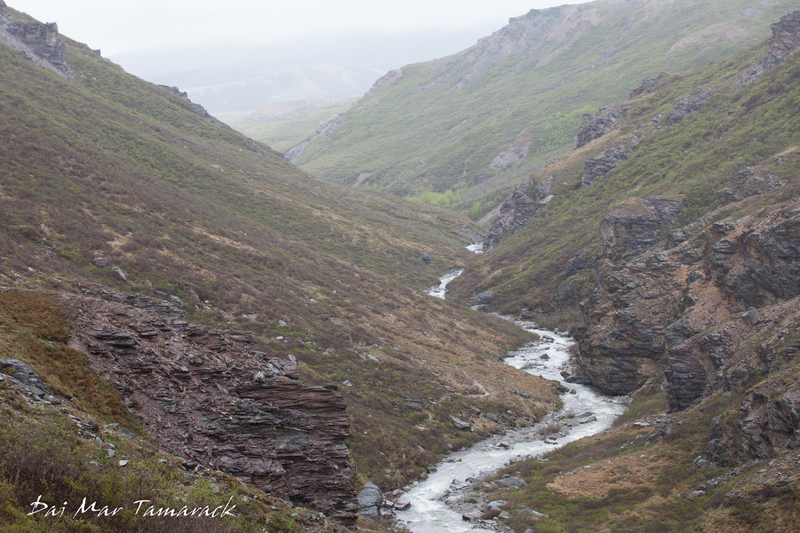 The only movement around us was the constant flow of the river and groups of Dall sheep playing on the cliffs above us. We walked in the rain for a bit but then even that passed leaving the valley with misty dew clinging to the rocks and vegetation. 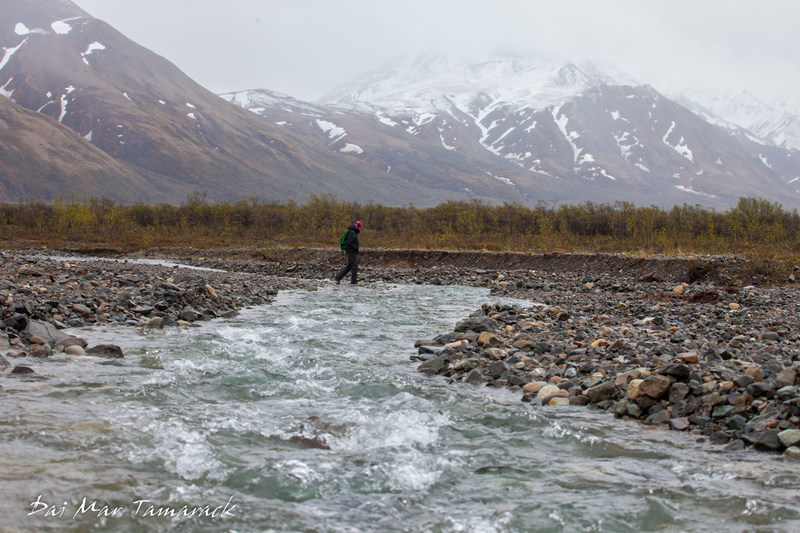 Looking back on our time in Denali I honestly see why it draws so many people to adventure here every year. The vastness is quite overwhelming, and the landscape a bit foreboding, but there is a draw here which is easy to see. 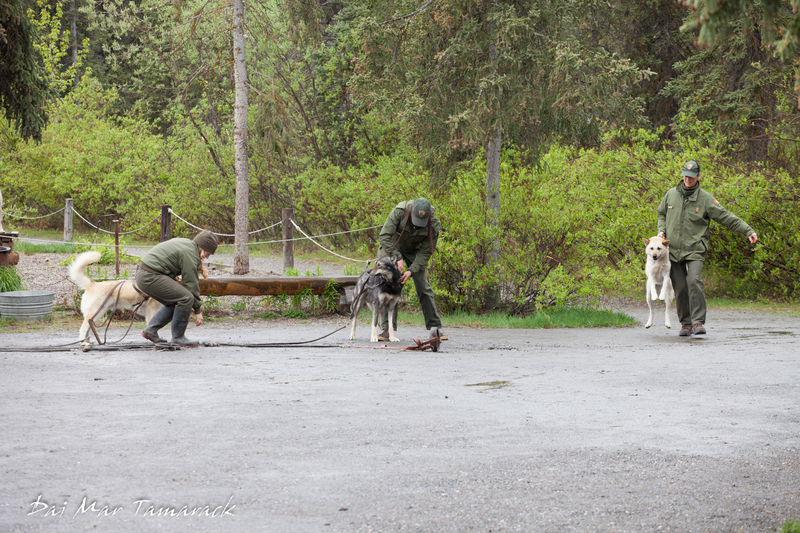 We couldn't come to Alaska without checking out some the national sport, dog mushing. 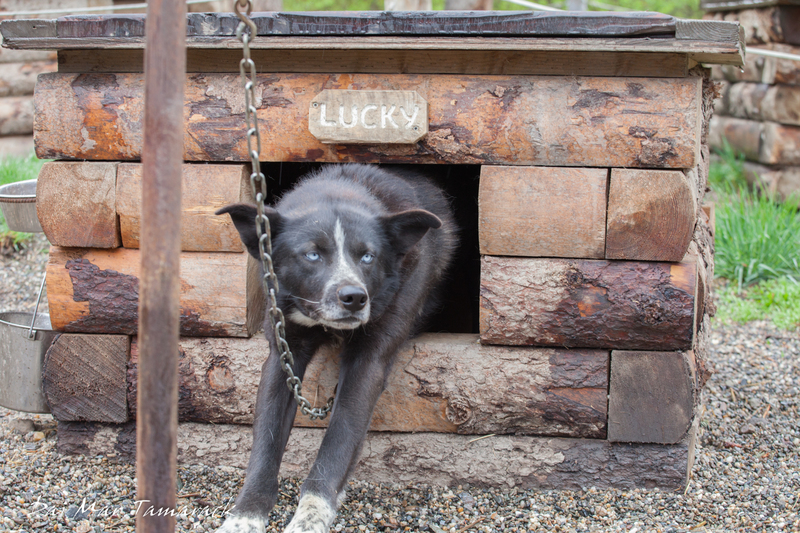 Denali happens to have the only working dog sled team in any national park so we figured this would be a great place to start. They do a couple of demonstrations with the dogs daily out at the kennels so we jumped on a free shuttle from the visitors center to check it out. After five minutes we were at the kennels. We were able to spend time with the dogs before the demonstration. They are all Alaskan Huskies, although they come in many colors, patterns, and only some had the typical blue eyes. Apparently they are bred based on demeanor, ability to work in a team, and pulling power. They were all so calm and definitely enjoyed a good pet or scratch which we whole-heartedly obliged. When it was time for the sled demonstration we all gathered into the stands and one of the park rangers gave us a bit of history or dog sledding, why it is still used in the park, and some interesting stories about their assignments in the past. 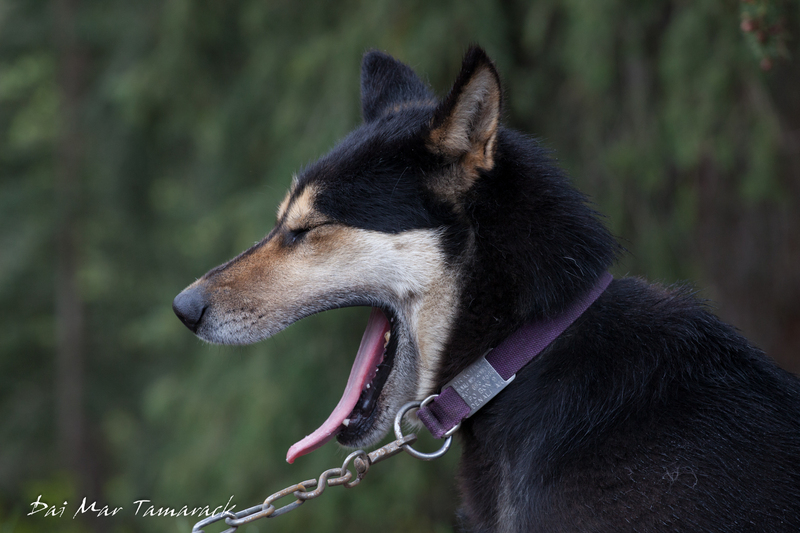 The most famous story is about a relay of dog sledding teams used in the winter of 1925. 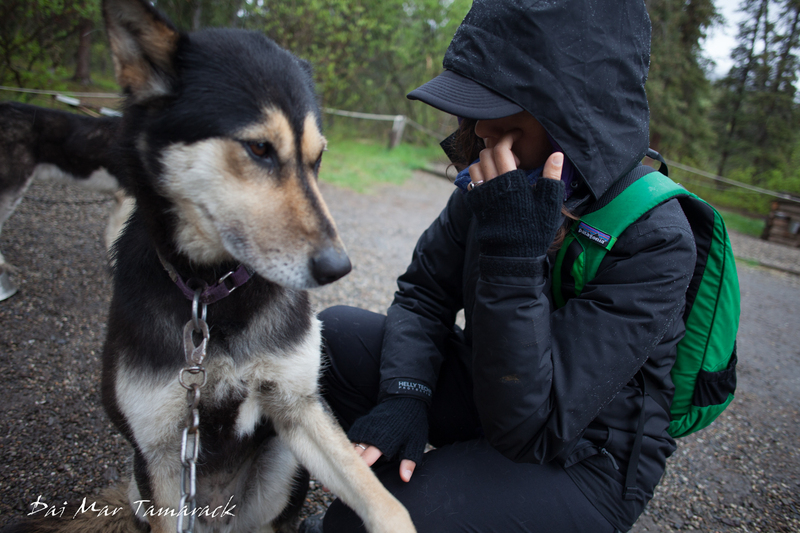 "The Iditarod Trail, now a National Historic Trail, had its beginnings as a mail and supply route from the coastal towns of Seward and Knik to the interior mining camps at Flat, Ophir, Ruby and beyond to the west coast communities of Unalakleet, Elim, Golovin, White Mountain and Nome. Mail and supplies went in. Gold came out. All via dog sled. Heroes were made, legends were born. 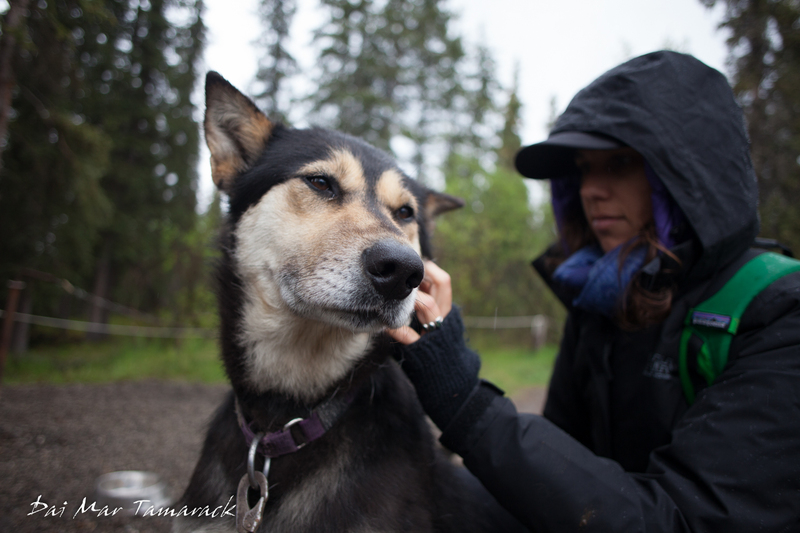 In 1925, part of the Iditarod Trail became a life saving highway for epidemic-stricken Nome. Diphtheria threatened and serum had to be brought in; again by intrepid dog mushers and their faithful hard-driving dogs. 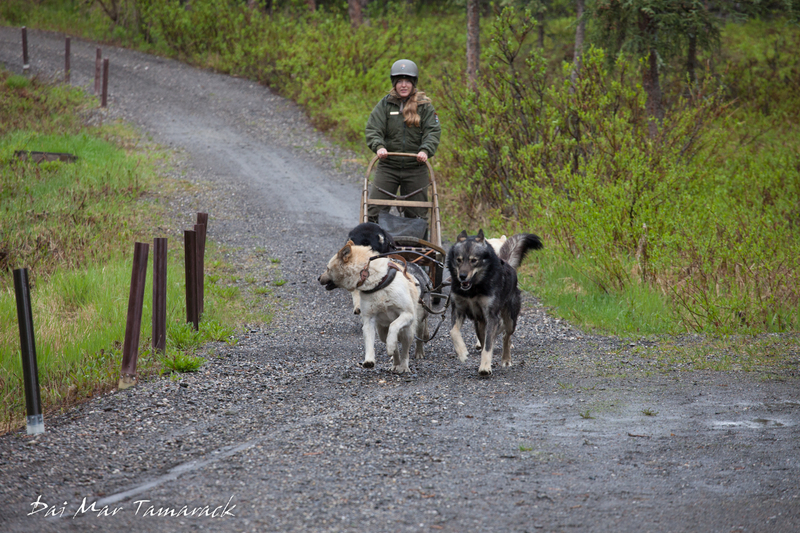 Throughout the years, the sled dogs were important to day to day life in the villages and throughout Alaska. 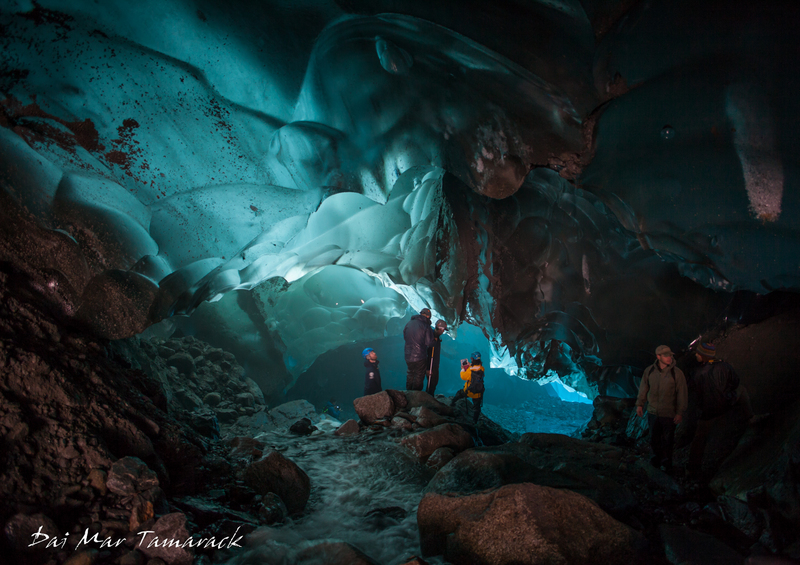 All of these examples and more are a part of Alaska’s history. Joe Redington had two reasons for organizing the long-distance Iditarod Race: to save the sled dog culture and Alaskan huskies, which were being phased out of existence due to the introduction of snowmobiles in Alaska; and to preserve the historical Iditarod Trail between Seward and Nome. These reasons were his life’s work." Another fun story they told was about a personal friend of the ranger's got his F-350 stuck in snow on the side of the road one winter. He couldn't get out even with the help of his friends' big trucks with winches. So what did they do? They called in two dog sled teams to the rescue. These dogs are able to go through terrain where snowcats and snowmobiles get hopelessly stuck, and working together as a team do some pretty amazing things. 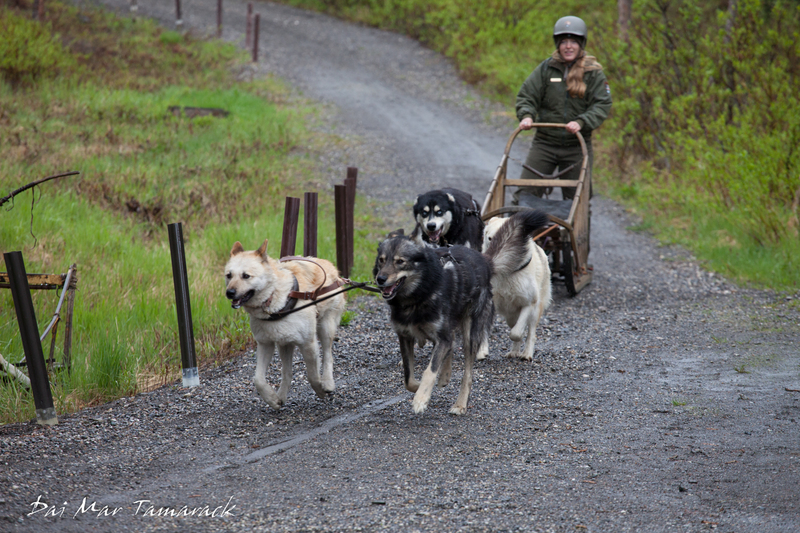 Perhaps the best part of the demonstration was when they chose dogs to strap in and be a part of the sled team. The dogs could sense this coming and the energy level of the kennels shot up exponentially. Seeing how excited the dogs were to pull was so fun. The barking didn't stop until after the demonstration when the chosen dogs were unharnessed and let run back to their kennels. 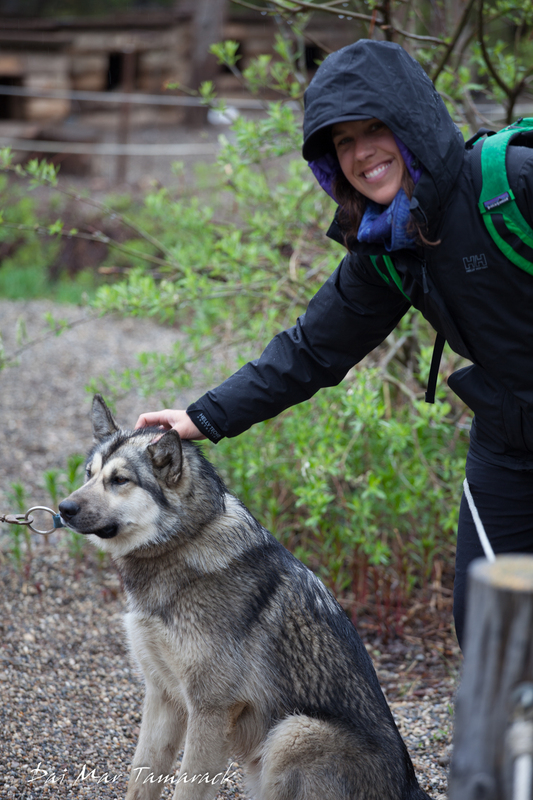 After the show we spend a little more time interacting with the dogs before jumping on another free shuttle to explore deeper into Denali National Park. 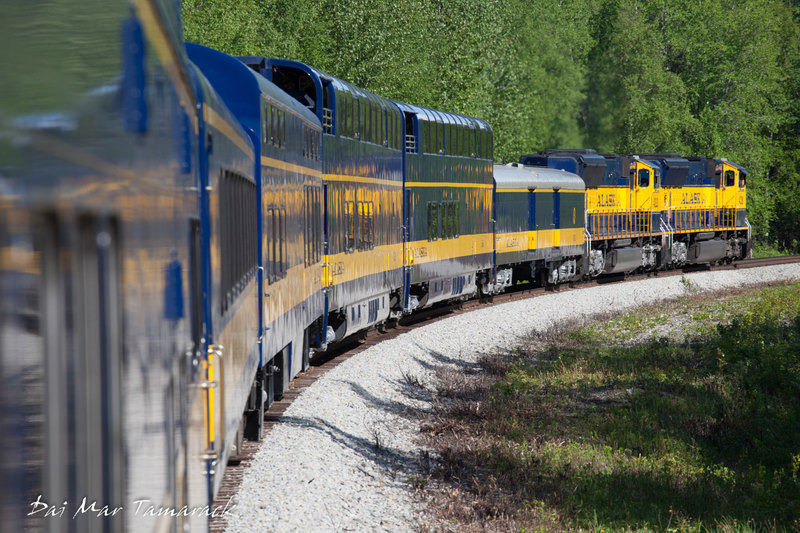 I have long heard tale of this scenic train ride through the heart of Alaska’s wild frontier. 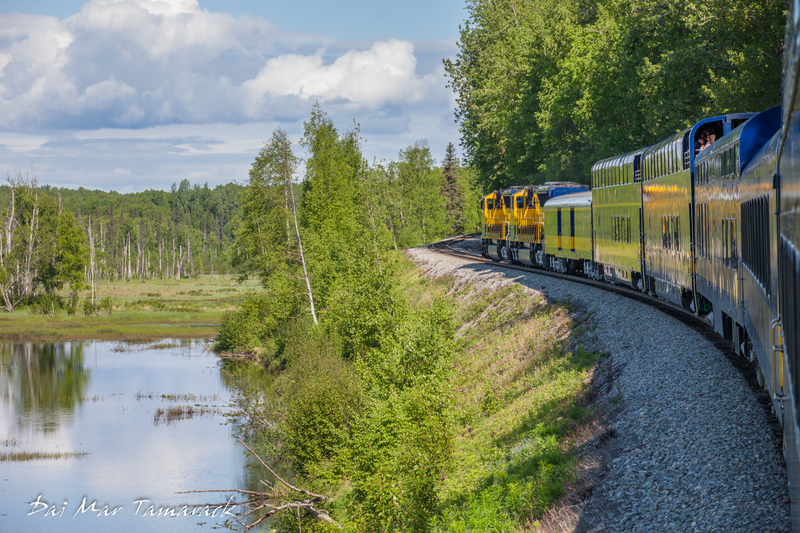 The Golden Star Line heads from mile marker 0 at Seward up North to mile 470 in Fairbanks. Along the way it passes glaciers, bogs, snow-capped peaks, tundra, forest, rivers, ponds, and if you are lucky maybe the great mountain itself, Denali, will peek out from the clouds. 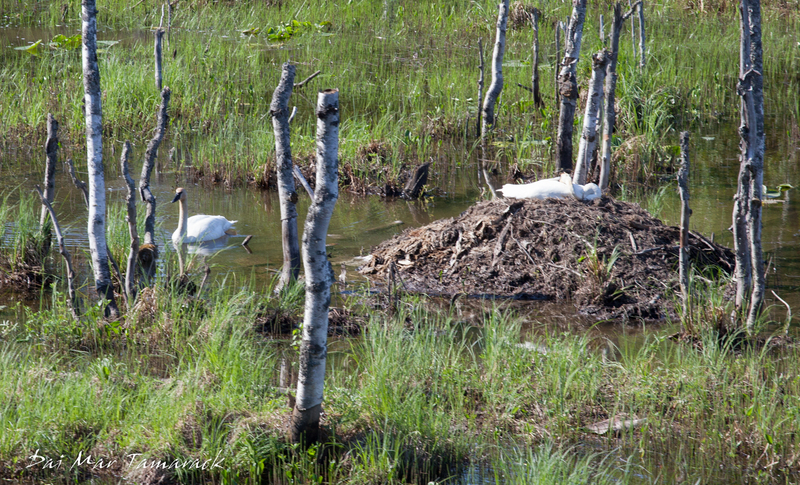 Sharp eyes can spot moose around the lakes, bears ambling through the woods, trumpeter swans on their nest, and bald eagles flying above. 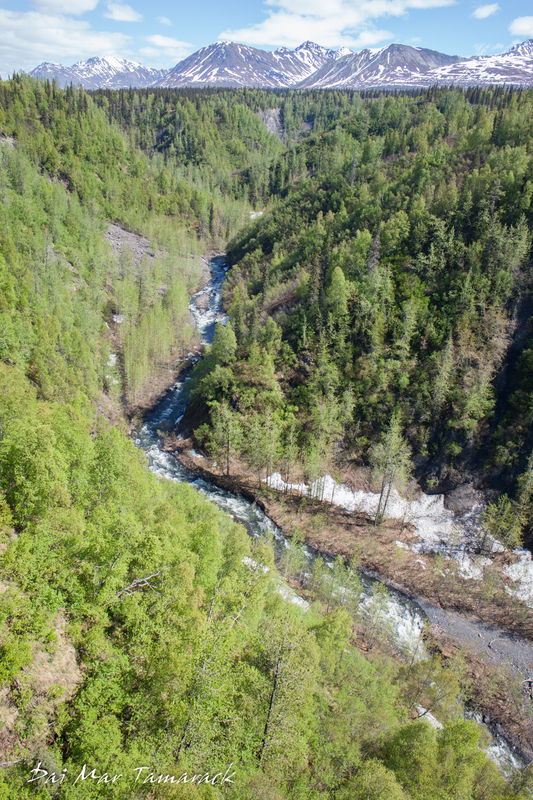 Most of the time is spent cutting through the wilderness, although towns like Whittier, Seward and Talkeetna provided brief glimpses of human population pushing back the wild frontier. When combined with the cities of Anchorage and Fairbanks, also located on the track, you can account for about 70% of Alaska’s population. It goes to show how important this railroad has been. 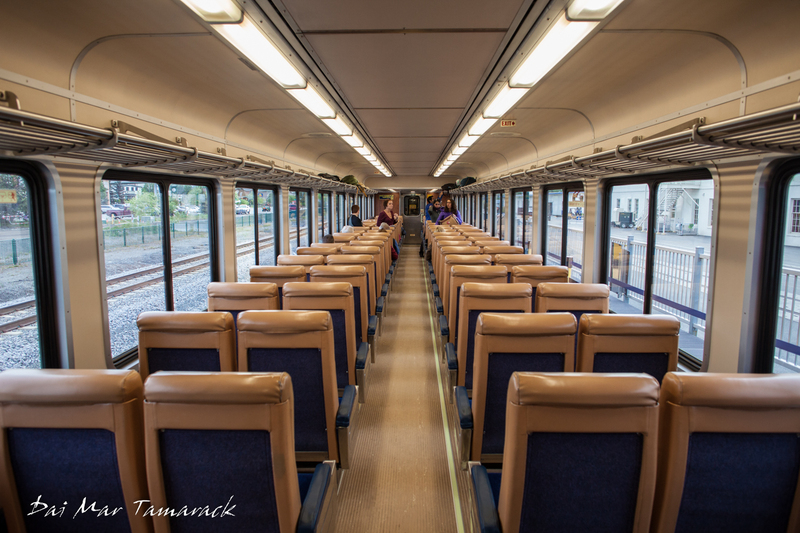 Heidi and I boarded the train for an 8:15am departure in Anchorage. 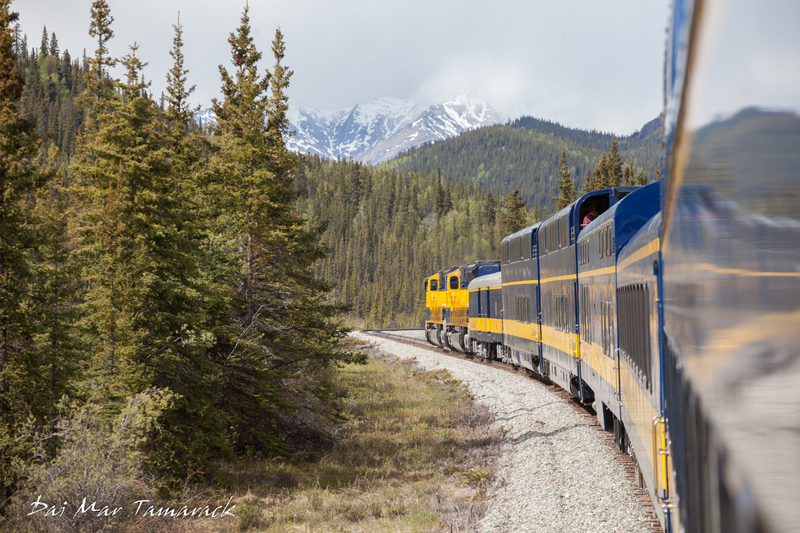 It is still a bit early here so we scored a slightly less expensive ticket for the ride to Denali at $131. 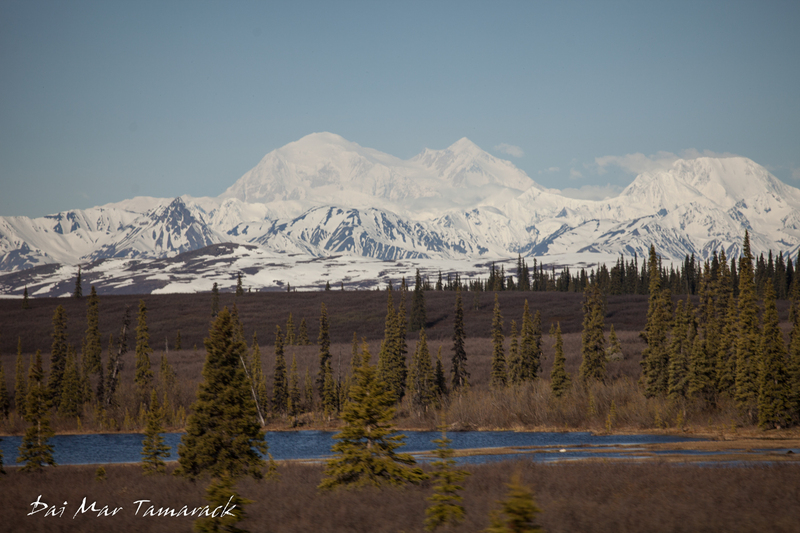 We expected to arrive at the Denali station around 4pm. The weather was nice and the early season crowd meant lots of room on the train. There is just something about riding on trains that brings out a special feeling in me. Maybe it’s a bit of nostalgia, or the ease of moving around, or the romance of it that strikes me as luxurious. Of course a certain amount of luxury comes from knowing that you have the time to travel at a slower pace, opening up the possibilities for a retreat from the hectic pace of life. I thought about this as I sipped my coffee, caught up on the news, and watched the wilderness through open windows. 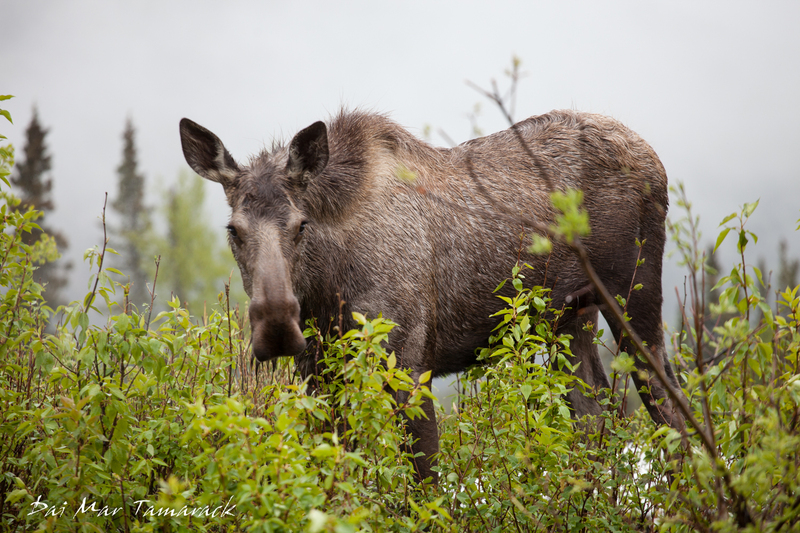 Just out of Anchorage we started spotting moose not far off the tracks. 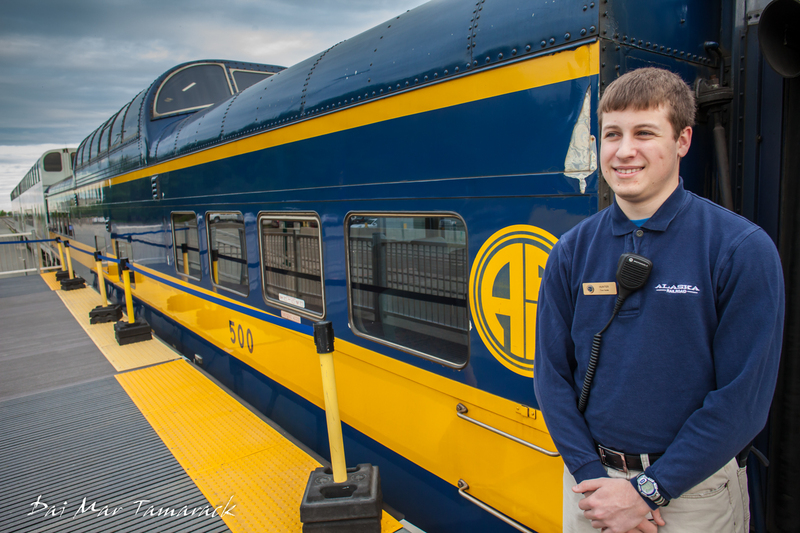 There were a couple of narrators on the train who would call out when animals were sighted by the engineers up front, and give us tidbits of information about places the railway took us through. 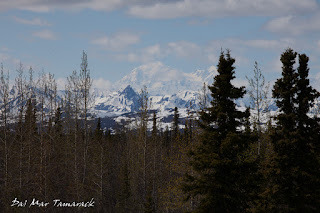 I really appreciated when they turned our attention to the Alaska Mountain Range on our left when the clouds cleared and Denali became visible. 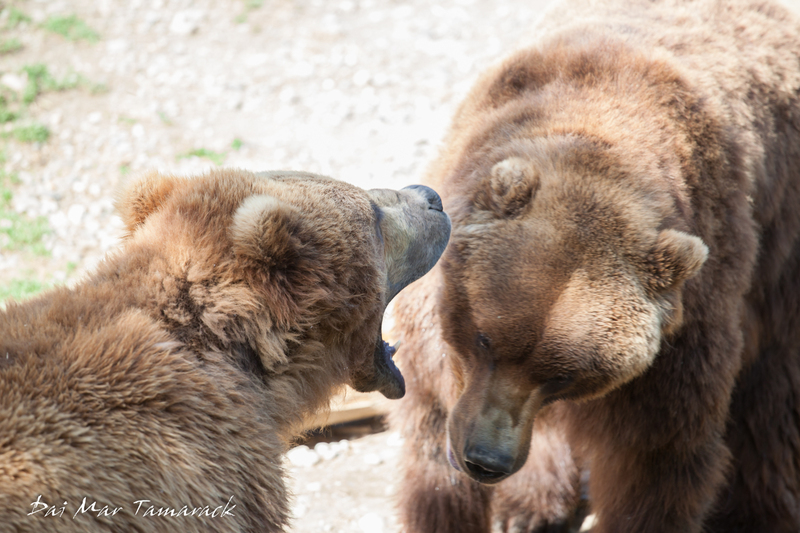 Having recently climbed Kilimanjaro, I did have a tinge of desire to tackle another of the seven summits, but the two-week ascent that it takes to make it up Denali is more than enough to keep me down with the animals in Denali National Park. The narrators told us we were quite lucky to see the mountain and that it qualifies us for the 30% club. Apparently only 30% of visitors to the region ever get to see Denali due to either bad weather or clouds hiding it from sight. 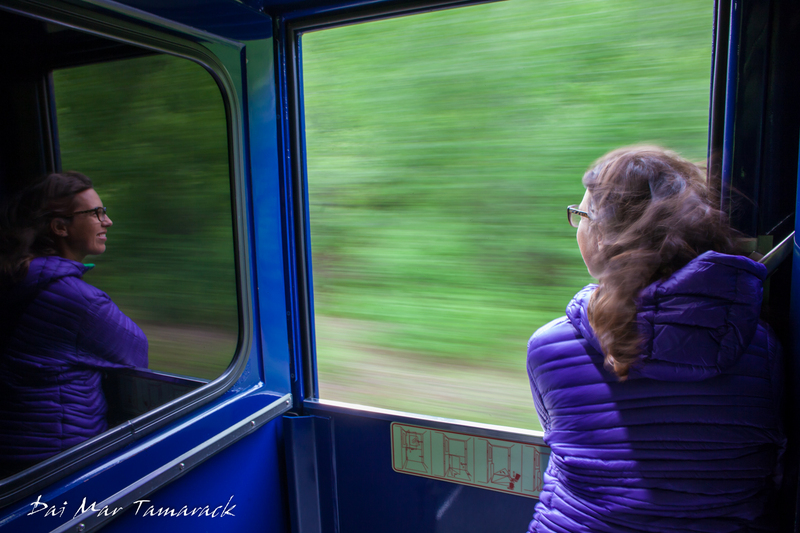 We spent about seven and a half hours on the train enjoying the scenery, the laid back atmosphere, food, beer, chatting with other travelers, and taking a ton of pictures while hanging outside of the train. 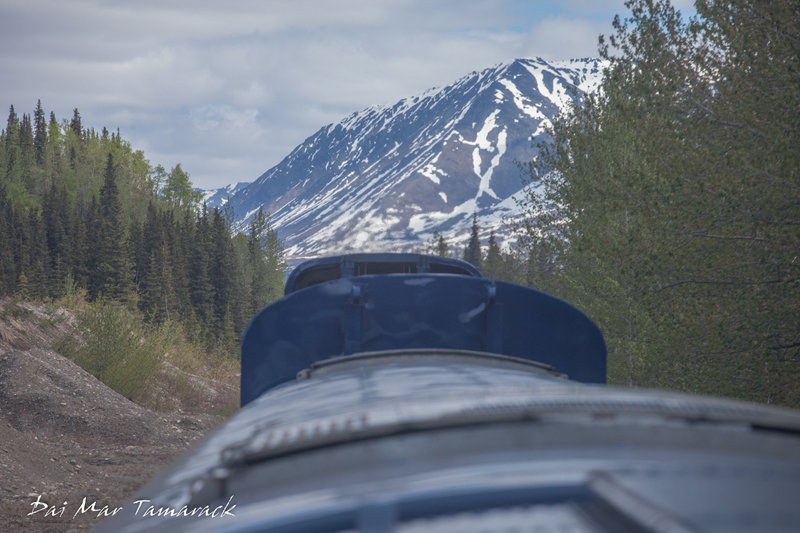 Even though you can easily drive from Anchorage to Denali these days, I highly encourage a ride back in time on this classic train through Alaska. There has been an adventure in the Juneau, Alaska area that has been on my to-do list ever since I saw pictures of it a year ago. 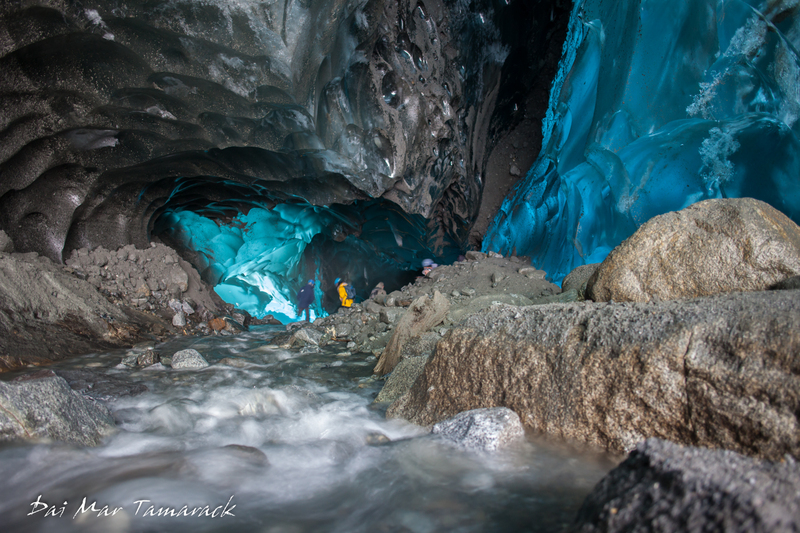 In the pictures I saw a person standing in a cave created out of blue ice, somewhere on the western edge of Mendenhall Glacier. 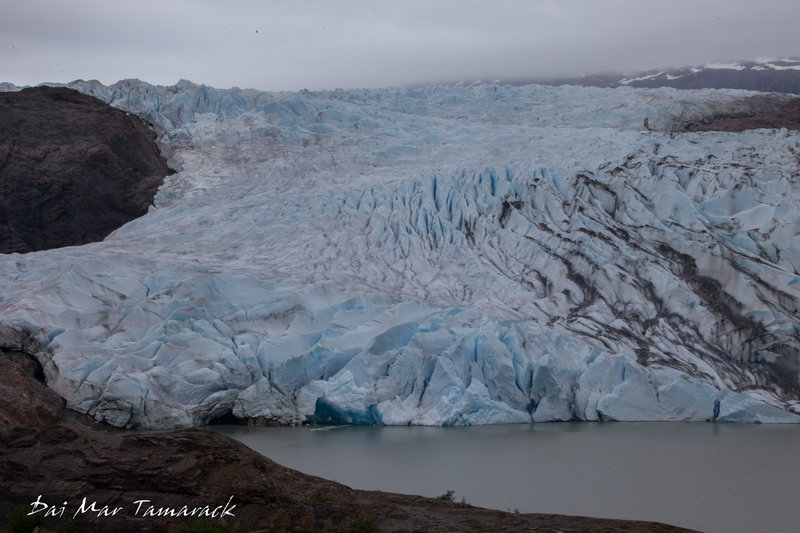 I visited the glacier last year with the tourist bus but saw no way to get to the western side. The glacier has receeded in recent times, about 1.75 miles since 1958, creating a huge lake which meant I would have to look more into finding these caves for next time. That next time was today! 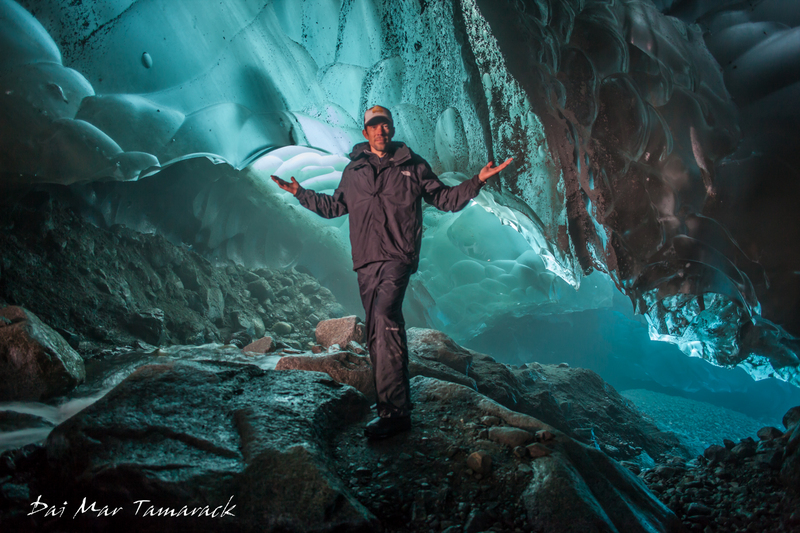 I asked around with some friends in Juneau about the ice caves and got some good tips. Start at the parking lot for the western glacier trailhead. Follow this for a ways, over a bridge, up switchbacks with hand rails, then at an overlook take the smaller trail towards the lake. A short ways in there is a sign warning against backcountry hiking and the need in the past for a lot of search and rescues in the area. Pushing on from here the trail becomes more difficult. The bush is quite dense along the trail so the possibility of startling a bear is a real worry. I made sure to keep the noise level up through these parts. Then the rock climbing starts. It's more rock scrambling than climbing. Luckily there are rock cairns built to mark the trail, and I use 'trail' here very loosely. There are a lot of ups and downs but you do get glimpses of the glacier which gives you the confidence you are headed in the right direction. 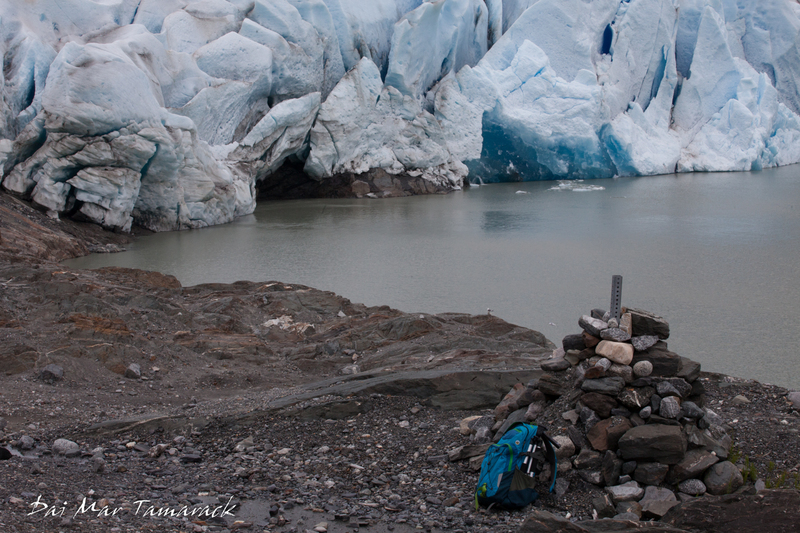 When you are almost to the glacier there is a little beach which would be so easy to kayak or skiff over to. In fact, I saw many people doing just this on my way back. This cuts 95% of the hike out of the equation making the destination much more attainable. 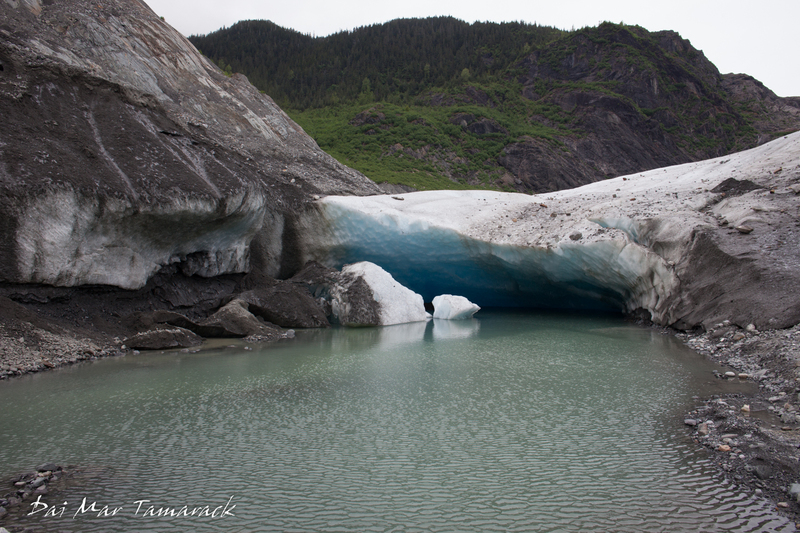 Next up is the leading edge of Mendenhall glacier. 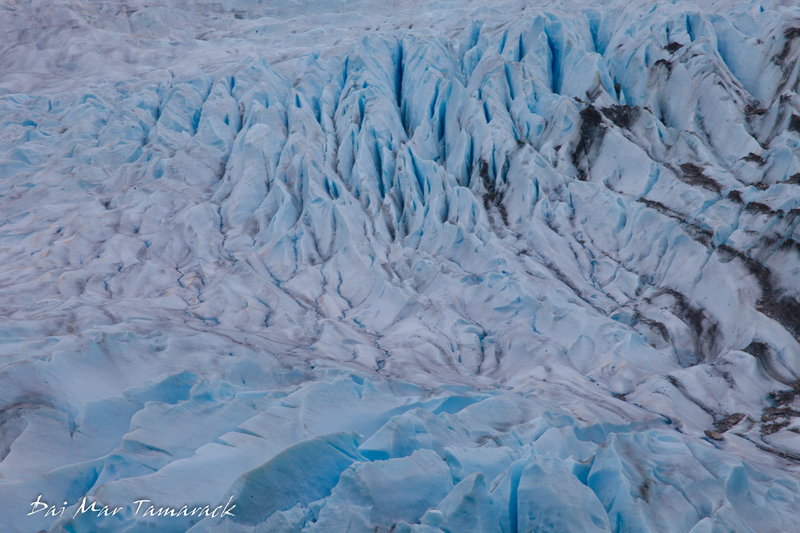 The distance is a bit hard to judge because of the sheer size of the glacier. 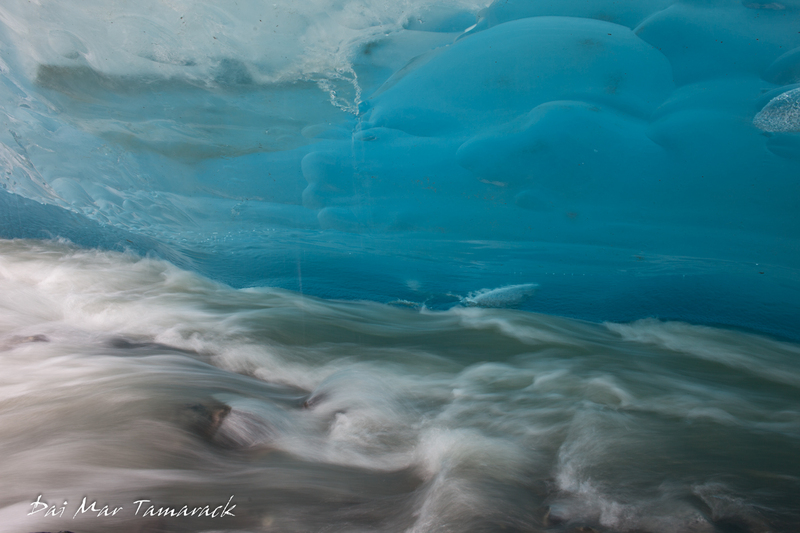 I wasn't sure at this point where to go for the ice caves, or if they would even be there since it is a shifting, moving, river of ice. 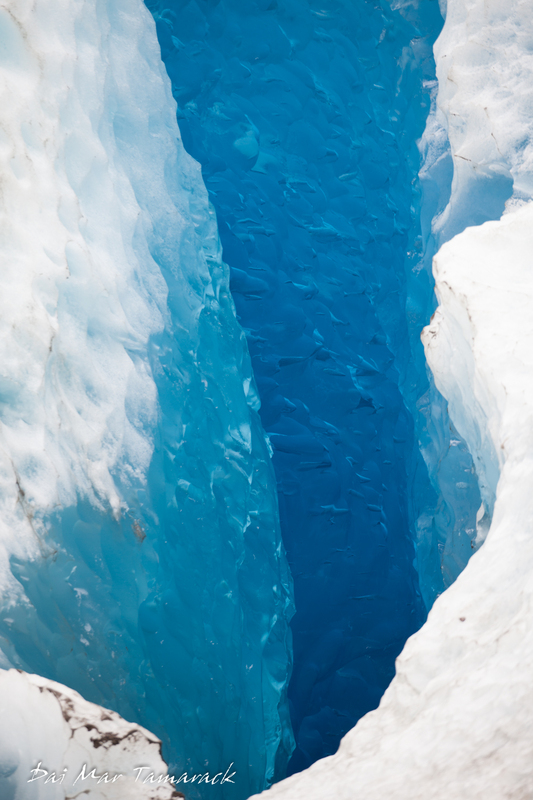 The first edge of the glacier you see along the trail is a beautiful overhang hiding blue ice below. 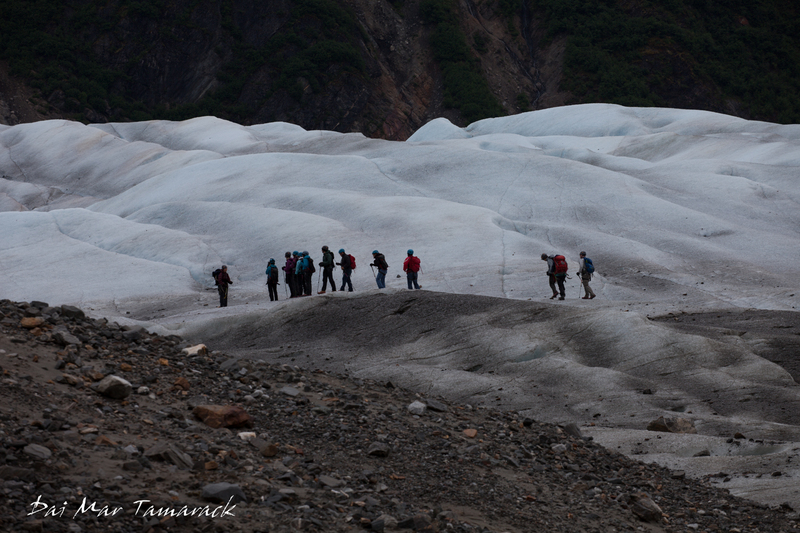 I scramble up and to the right which turned out to be not necessary although fun being right next to the glacier. What I was really searching for is around this first overhang to the left. 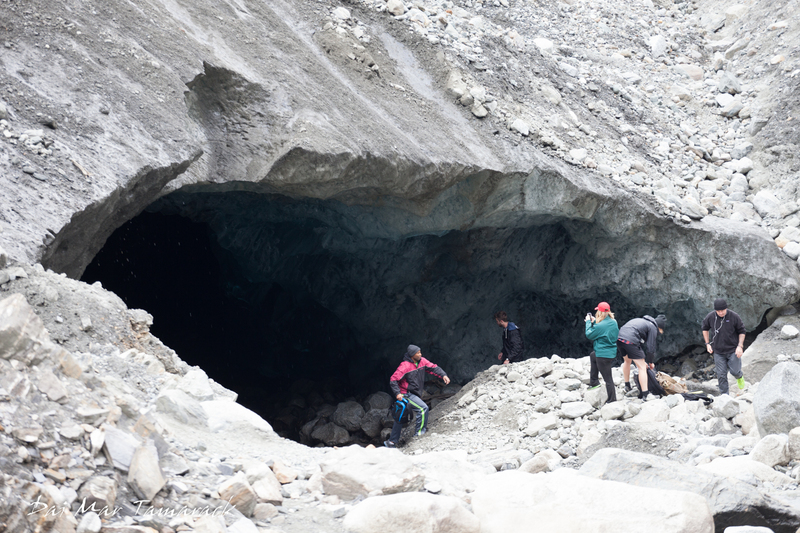 Another group being led by two guides headed around to the left so I followed them until they started checking out this huge dirty looking ice cave. 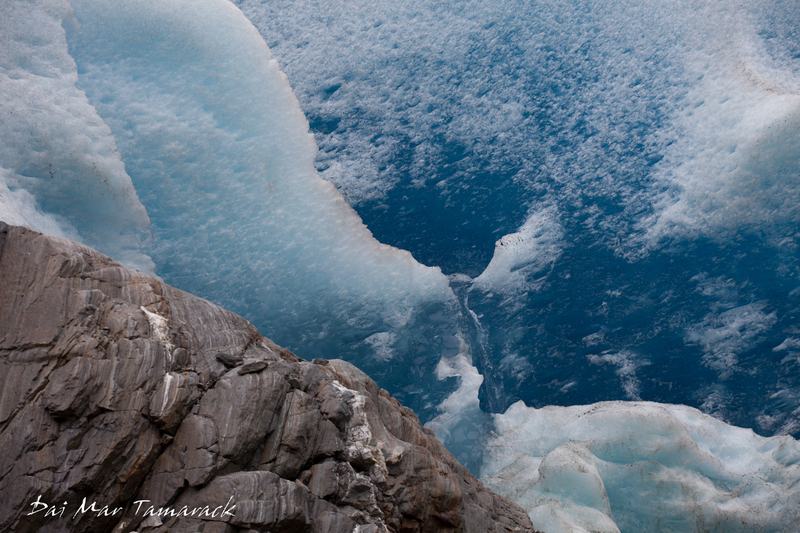 I figured I would push on past them to find some blue ice and maybe check out this big opening on the way back down. 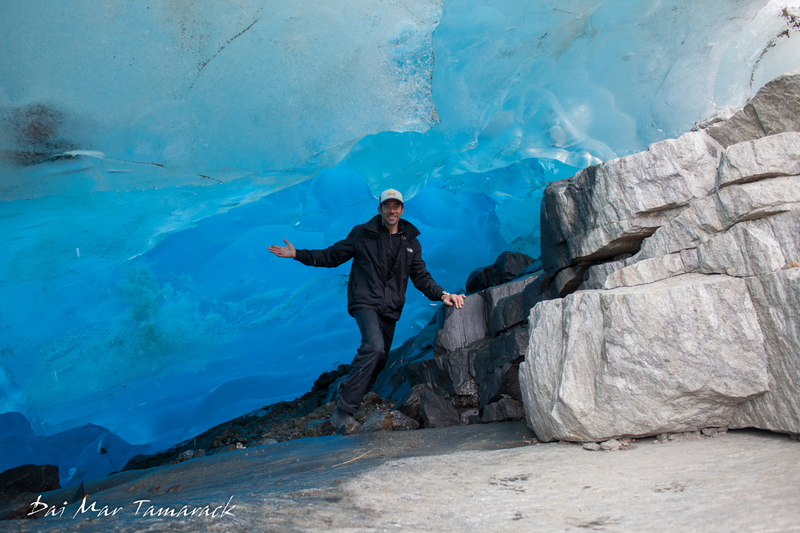 I was able to scramble quite a ways up the left side of the glacier. 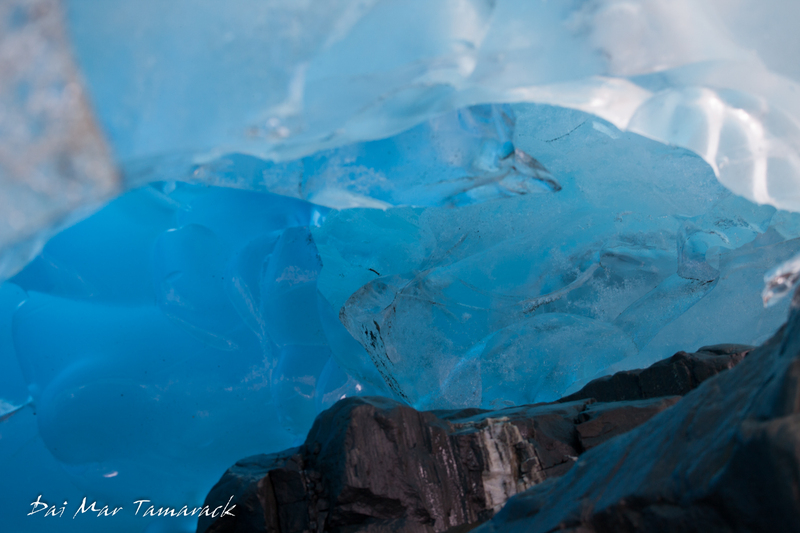 There was a lot of blue ice with some little caves but I couldn't find anything like I had seen in the pictures a year before. 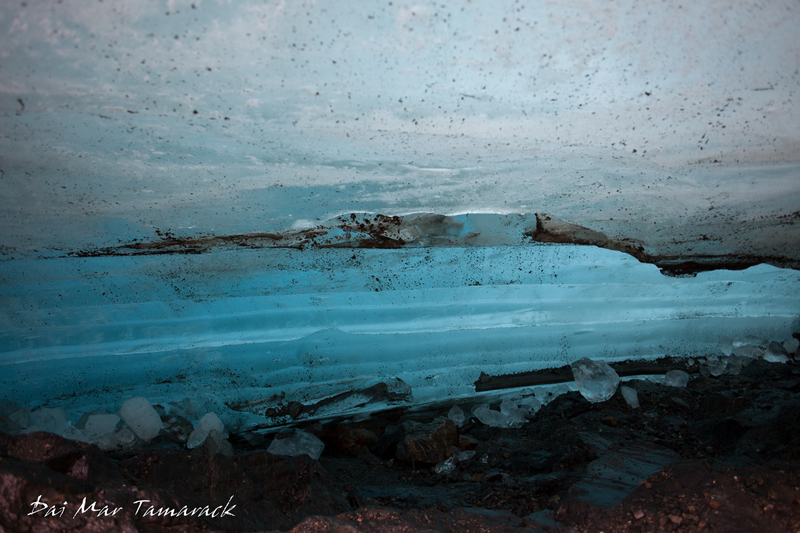 I carefully made my way back down the rocks, careful to avoid slipping which might lead to sliding under the glacier to unknown depths. There were more people at the big dirty cave so I went in for a closer look. It was a good thing I did. Once I was close enough for my eyes to adjust to the darkness in the interior of the cave I realized it was much more massive than it first appeared. 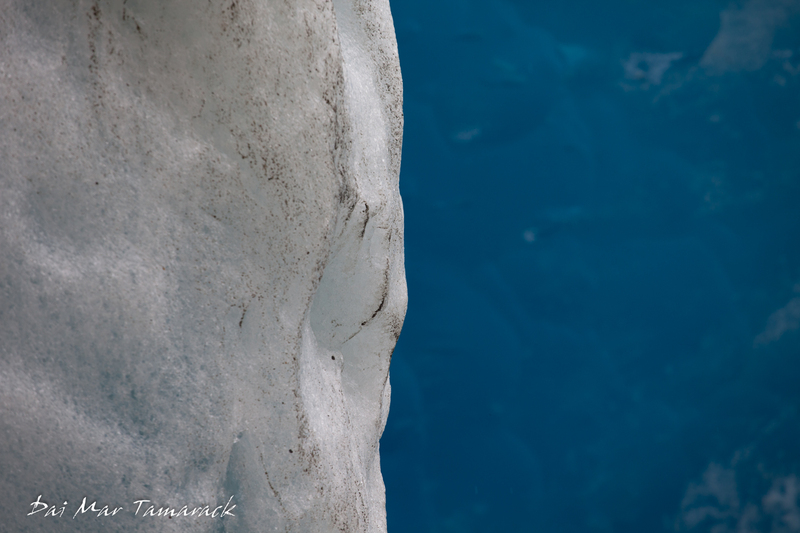 I also noticed some piercing blue ice formations inside. The fact that most people had hard hats on when entering the cave did not go unnoticed either. It made perfect sense as every couple of minutes large rocks would slide off the top of the cave roof to crash against the pile of rocks in front. 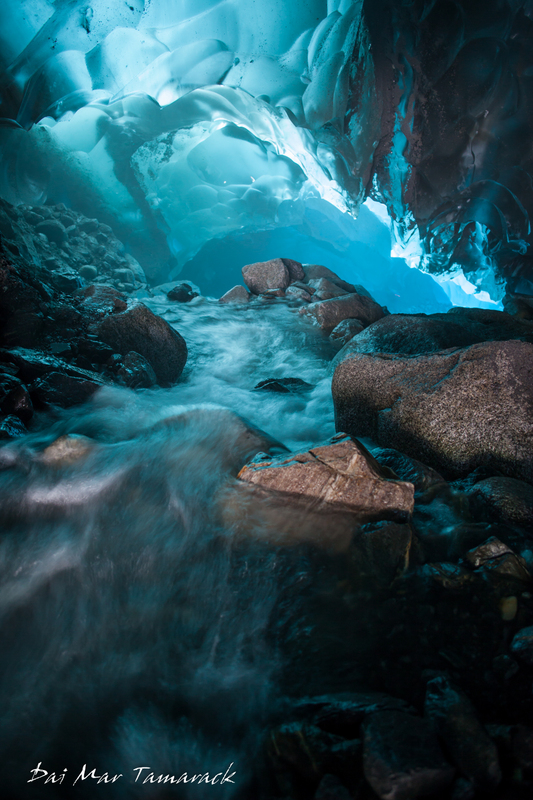 Each time a rock slide happened sounded like an explosion echoing through the cave. It reminded me of the ever-present possibility that the cave would collapse. I decided I would put my jacket hood up for extra protection, trust that the cave will persevere for another day, and head inside to complete my mission that has been a year in the making.